37a. [Like oil spills and clearing of rain forests], ECOCIDAL. Have you heard about this Gulf of Mexico oil spill, the damaged rig that’s been spewing oil into the waters for 14 years and isn’t stopping? Terribly sad and maddening. 42a. [Certain Febreze targets], PET ODORS. Heh. You see the phrase on those odor-fighting products, but when do crosswords acknowledge the cat pee and dog poop? 1d. [Some disguised fishing trawlers], SPY BOATS. Those are a thing? Okay. 2d. [Nebulous], CLOUDLIKE. I prefer clouds to the cloudlike. 8d. [“Y” with a bar], YEN SIGN. Meh. Plus, a key word is repeated in the HONKS clue, [Signs of rush hour]. Distracting. 34d. [Formulaically humorous], SITCOMMY. Is that a word? It looks terrible. Surprisingly smooth and zippy fill for a 64-worder. Hardly any 3-letter entries, and not many 4s, either. Those themelesses with stacked 15s usually have so many ucky little 3s and 4s, it makes them less fun. 29d. [Belgium’s longest-reigning monarch (44 years)], LEOPOLD II? Yeah, those were not a good 44 years. He was pretty much a greedy monster who ranks right up there with the biggest genocidal dudes. Idi Amin has nothing on Leopold. Dracula puns! This seems like something I should like. Let’s see what we’ve got. 23a [Dracula’s quilt fill?] DOWN FOR THE COUNT. Double play on words. A nice start! 16d [Dracula’s boat?] BLOOD VESSEL. I’m going to interpret that clue as [(The name of) Dracula’s boat? ], because it doesn’t work as well otherwise. Also, the pun here is on the word “vessel,” not on “blood” which is the key component as far as Dracula is concerned. 33a [Dracula as an overindulged child?] SPOILED BAT. Okay, we’re also changing words as needed. But that’s all right, we can adapt. It’s all in service of the jokes, so I’m good with this. 47a [Threatening adversary for Dracula?] STAKE HOLDER. Nice. I guess you can say both Van Helsing and Jonathan Harkness had a stake in Dracula’s demise. 64a [Dracula, when he’s annoying?] PAIN IN THE NECK. I guess we should have seen this one coming. I’m sure I’ve heard this one before. 63d [Bedtime for Dracula?] COFFIN SPELL. Coughing spell. Um, not quite. Dracula’s bedtime is dawn, so I was looking for a pun related to that. But I’m okay with the pun; what I have a problem with is cluing “bedtime” as “spell.” A spell is a length of time. A bedtime is a specific point in time when one goes to bed. [Dracula’s down time?] makes a better clue, IMO. 85a [Sweet drink for Dracula?] SUCKER PUNCH. There we go. That’s more like it. 98a [Why Dracula’s would-be pickup rejected him?]. NOT HER TYPE. Hmm. I don’t think so. First off, the clue really looks like it’s talking about trucks. Second, the pun is on the word “type,” right? As in, “blood type”? Well, a woman ol’ Drac is hitting on is presumably not a vampire, so she shouldn’t care one whit about his blood type. It should be the other way around. [Why Dracula rejected a particular woman’s advances?] would make sense with the answer NOT HIS TYPE. 113a [Lived a purposeful life, like Dracula?] DID NOT DIE IN VEIN. Another miss. There’s no pun here. This clue works for the non-punny DID NOT DIE IN VAIN. What does it mean to “die in vein” or to “not die in vein,” even for Dracula? There’s not a lot of surface sense here. So I would say this whole entry needs to be scrapped in favor of something else. On the whole I liked this theme. The puns are mostly good (as puns go), nothing too groan-worthy. And the title is just right. But I think some tweaks in cluing were necessary for consistency’s sake, and I don’t know if that last one is salvageable. But on the whole, I’m left with a positive vibe, and that’s a good thing. Fill-wise, CONTAINERS, SHORT-TERM and FALLS ON are all just okay. ETHIOPIA is good, and so is TOE TO TOE and the oddly-spelled PENLITES, but SAGE HEN [Pomona College player] is tough when GAME HEN looks far more probable. KIA SEDONA is good, and so is BEERSHEBA [Israeli desert city], but the latter looks like it’s just dying to be made into a punny theme answer. ADULT MOVIE is odd. I think “adult film” is more in-the-language, and the clue [“The Devil in Miss Jones,” e.g.] feels like it’s bordering on gratuitously graphic. A more generic [It’s not fare for kids] would be more welcome. There’s the usual amount of crosswordese: OTOES, DAH, PDAS, EIRE, ERTE, ARTE, etc., but I didn’t get the feeling that it was out of hand. Oh but wait, there’s this one: IIII [Old sundial number] with its crosser RENIN [Kidney enzyme]. And then ACTH [Pituitary hormone]. I think that last one does go a step too far in the obscure fill department, especially crossing weird abbreviation MEDIT [View from the Fr. Riviera]. For the most part though, I like the idea of this theme and the puns were suitable. There are certainly some detracting elements in the grid, but I enjoyed the solve. 3.5 stars. Another crossword from my favorite Double Cross constructor from Games Magazine, Michael Ashley. This played fairly easily for me, as I got this solved in under 6 minutes, but there was a lot of fun stuff in here. 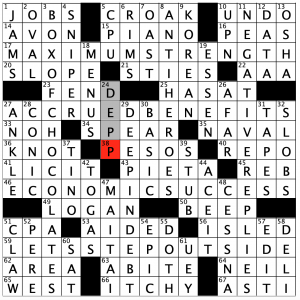 Interestingly, there isn’t an entry longer than 11 letters in the grid, so that seems to make for stellar fill. I have heard some complaints in recent months about LAT fill in general, but I don’t see it. Perhaps I am just happy these puzzles aren’t made by Maleska! (If you have never solved a Maleska NYT, look one up. They are brutal!) But even for a short solve time, I can say I had fun with this one. 4.6 stars for this one! 1A [“Grab that guy!”] “SEIZE HIM!” – A great casual phrase, although perhaps a little dated! Sounds like something out of a medieval movie! 16A [Name attached to 14 Grand Slam tennis titles] EVONNE – This is talking about Evonne Goolagong, a great tennis player from Australia from the 70s and 80s. 25A [2017 NLDS player] NAT – Note this doesn’t mention 2018. This talented team vastly underachieved in 2018, finishing only 8 games behind the surprising Atlanta Braves even though they were only 2 games over .500! 46A [Green target] CUP – A nice golf clue. I was thinking “green” as in “eco”. Whoops! 67A [Fly to flee] TSETSE – This is, at least to me, a fresh and clever way to clue this common pest. 68A [Ashley’s twin] MARY-KATE – Or, if you believe John Oliver, they are really one person moving back and forth really fast! 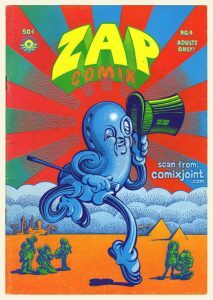 4D [1960s pioneer in countercultural strips] ZAP COMIX – I have never heard of this comic book. That is probably a good thing! 6D [“60 Minutes” creator Don] HEWITT – There is also a famous tennis player from Australia with this surname, but we have enough Aussie tennis players in this puzzle! 23D [Island spirits] JAMAICA RUMS – I had JAMAICAN RUM in here, and that seems like a better way to say this. My only gripe in the puzzle, but I figured it out quickly! See you on Tuesday for another LAT writeup! This puzzle was a classic example of how sometimes putting the puzzle down helps immensely. I get these puzzles early for blogging purposes, and I found this quite challenging at first. But after putting it down for literally a day or so, I picked it back up and proceeded to smoothly fill in the grid like it was no problem. Why is that? In case you’re wondering, I did finish this solve at like 4:30 am (I couldn’t sleep! ), so it was quiet and peaceful at that time, if nothing else. But why can’t you solve the puzzle the same way at the beginning? Some of you elite solvers may not have this problem anymore, and if you have kids, well, I don’t need to explain. But particularly in this instance, it seemed like I was solving two different puzzles. Isn’t the brain fascinating? Great puzzle by Greg today, and I am fast becoming a huge fan of his puzzles. 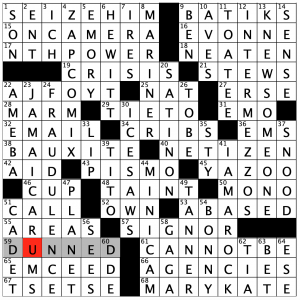 A tough 72-worder today with 6 15s interlaced in the grid. Extremely well done and a fun solve. 4.7 stars for this one. 17A [For worst cases] MAXIMUM STRENGTH – This one elicited a grin from me. Worst case headaches are what is referred to! 41A [Kosher] LICIT – I never know, especially if I have L??? ?, like I did in this instance, if this is LEGAL or LEGIT or the correct LICIT in this case. 59A [Fighting words] LET’S STEP OUTSIDE! – Best entry in the puzzle! 64A [Second to Elton in Adult Contemporary Top Ten] NEIL – Diamond or Sedaka, I wonder? 3D [It may hold many paper cups] BOX OF CHOCOLATES – Great misdirection clue here. Another grin happened here, I am sure of it! 4D [Certain Marine Corps school graduate] SNIPER -Were you looking for a six-letter rank as well? 8D [Many Nicholson portrayals] ANTI-HEROES – It must be that creepy look he is good at! 24D [Ichabod Crane in “Sleepy Hollow”] DEPP – Were you looking for a four-letter occupation as well? OK, that might just be me! 29D [Likely to benefit from restructuring] DEEP IN DEBT – This was also well done. Only one NYT hit for this one, and it was over 40 years ago. 58D [Slimmed-down version of prepared food] DELI – Does this mean that this is short for delicatessen? Someone explain! This entry was posted in Daily Puzzles and tagged Byron Walden, Greg Johnson, Michael Ashley, Randolph Ross. Bookmark the permalink. 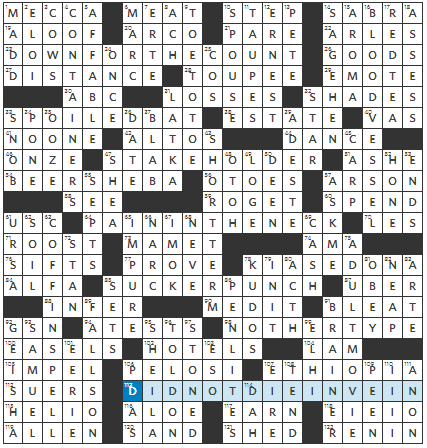 NYT: I agree, it’s a very clean grid and not full of esoterica, so I greatly appreciate it. That top line with SCHLUBBY and POTASH is great. And there are other good lines, as in: There goes that ECOCIDAL KNAVE! Huda, thanks for this wonderful earworm. Yeah, it’s playing in my head too. I like to listen to both the version that Penguins linked and the one from 2000 when her voice had really changed. It had less range but it sounded even more soulful. It’s especially moving to hear about not knowing life at all from someone in their 20’s and again as they’re approaching sixty. NYT: Started right off filling 1A with SLOVENLY like a boss. That didn’t work out. Some real old fashioned stuff here, BRAINED used like a 30’s movie gangsterspeak & the Times’ ongoing insistence that “cabbage” as slang for money is still a thing. Didn’t like this as much as Amy. NYT was a puzzle where the first pass yields practically nothing– but is (eventually) solvable. A good one with a few obscurities. Two bars through a letter is a standard currency unit indicator (Euro, Yen, Yuan, Won, Dollar [original form], Peso, Naira, Rupee). 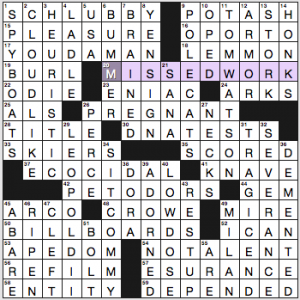 NYT: In addition to the “sign” dupe, “miss” is also in the grid and in a clue. Liked most of the puzzle; “sitcommy” sucked big time. LAT: Like Derek, I had “Jamaican rum” (in the puzzle, not for breakfast). A few other mistakes – “sledCAM” for MINICAM (which led to “sully” for TAINT” and “Yanner” for TANNER) – but those were soon fixed. Loved those Zs in INTERMEZZOS. 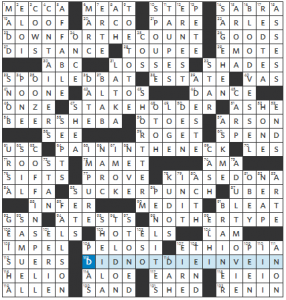 The NYT had some *great* entries – very fun solve. I just came home from visiting Portugal including a cruise on the Douro River. The town is not Oporto. It is simply Porto. I even asked that question since I’ve seen Oporto in crosswords before. I was told that the O as a separate word is something like the word “the” and grammatically, an article has to be used for a city in some situations. Somewhere along the line English speaking peoples misunderstood that. Yes the main soccer club is simply FC Porto. Thank you. Now the spelling of Port wine makes sense. I’ve always wondered about that. Yes Derek, DELICATESSEN as in the food, not the store. Wasn’t the answer to 25A Arnolds? “Al” was the owner but wasn’t it called Arnold’s? I think it was character-based. The first few seasons, the owner of the bar was Pat Morita, who played Arnold. Morita left the show and was replaced by Al Molinaro, who played new bar owner Al Delvecchio. But the Happy Days gang still referred to it as Arnold’s, not Al’s. I bet Erik had no trouble with 51-D (one of his many correct “questions” on his recent Jeopardy! run). NYT has lots of stuff that’s unusual, tough, and fair. Liked it But maybe not so sure about sitcommy.